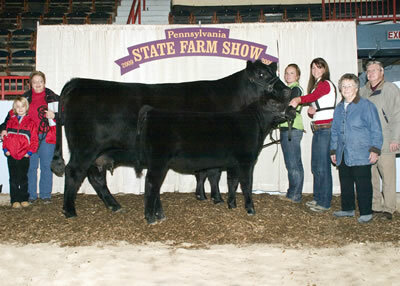 Rains Real 004 Traveler 004R won grand champion bull at the 2009 Pennsylvania Farm Show's Angus Show, January 12 in Harrisburg, Pa. Dale Rains, Mercer, Pa., owns the April 2007 son of S A V 8180 Traveler 004. He earlier won junior champion. Tom Turner, Columbus, Ohio, evaluated the 128 entries. 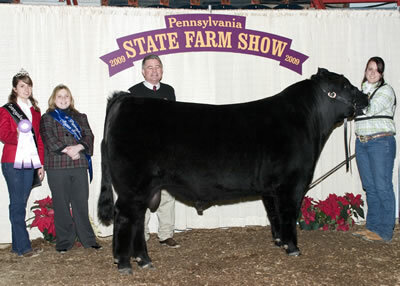 H J M Black Ice 707 won reserve grand champion bull at the 2009 Pennsylvania Farm Show's Angus Show, January 12 in Harrisburg, Pa. Megan Fuls, Richland, Pa., owns the September 2007 son of G 13 Structure. He first won senior calf champion. Tom Turner, Columbus, Ohio, evaluated the 128 entries. 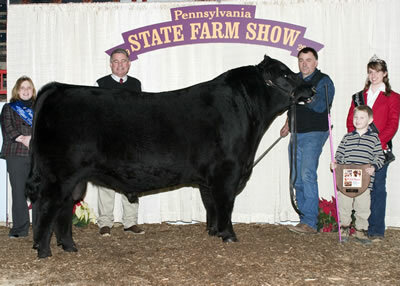 Rains Skylight CeeCee CCRF won grand champion female at the 2009 Pennsylvania Farm Show's Angus Show, January 12 in Harrisburg, Pa. Dale Rains, Mercer, Pa., owns the January 2008 daughter of Buffalos Conclusive BN46. She earlier won early junior calf champion. Tom Turner, Columbus, Ohio, evaluated the 128 entries. 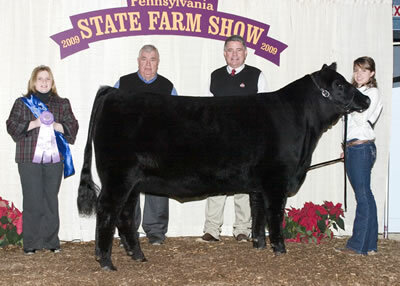 Freys KJF Ark Pride M35 S107 won reserve grand champion female at the 2009 Pennsylvania Farm Show's Angus Show, January 12 in Harrisburg, Pa. Katrina Frey, Quarryville, Pa., owns the September 2007 daughter of Connealy Danny Boy. She first won senior calf champion. Tom Turner, Columbus, Ohio, evaluated the 128 entries. 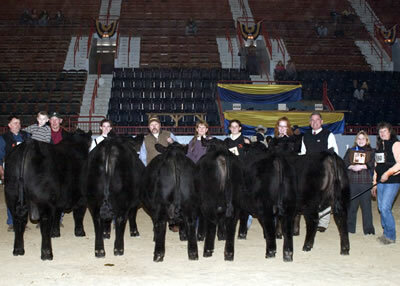 Weaverland Blackcap Isabel won grand champion cow-calf pair at the 2009 Pennsylvania Farm Show's Angus Show, January 12 in Harrisburg, Pa. Weaverland Valley Farms, New Holland, Pa., and Hawthorn Farm, McVeytown, Pa., own the September 2003 daughter of B/R New Frontier 095. A September 2008 heifer calf sired by G A R Predestined is at side. Tom Turner, Columbus, Ohio, evaluated the 128 entries. 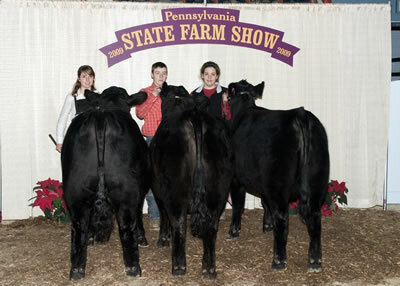 U H A 095 Burgess 348 036 won reserve grand champion cow-calf pair at the 2009 Pennsylvania Farm Show's Angus Show, January 12 in Harrisburg, Pa. RT 231 LLC, Charlottesville, Va., and Jaclyn Upperman, Chambersburg, Pa., own the March 2006 daughter of B/R New Frontier 095. 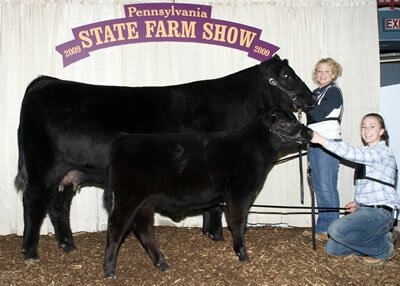 A September 2008 bull calf sired by Rito 4L60 of 2536 BVND 208 completes the pair. Tom Turner, Columbus, Ohio, evaluated the 128 entries. 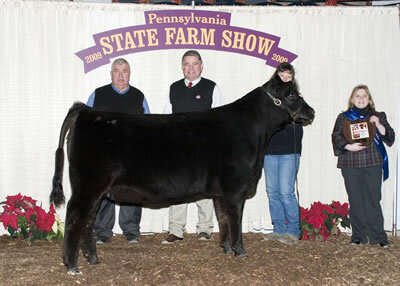 The progeny of G 13 Stand Out won junior get-of-sire at the 2009 Pennsylvania Farm Show's Angus Show, January 12 in Harrisburg, Pa. Katrina Frey, Quarryville, Pa., owns the winning trio. 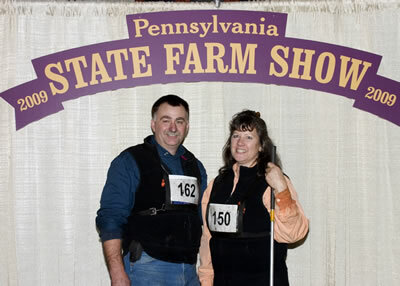 Dale Rains, Mercer, Pa., won breeders' best six head at the 2009 Pennsylvania Farm Show's Angus Show, January 12 in Harrisburg, Pa.
Dale Rains, Mercer, Pa., won premier exhibitor at the 2009 Pennsylvania Farm Show's Angus Show, January 12 in Harrisburg, Pa. Pictured from left includes Dale and Brenda Rains. 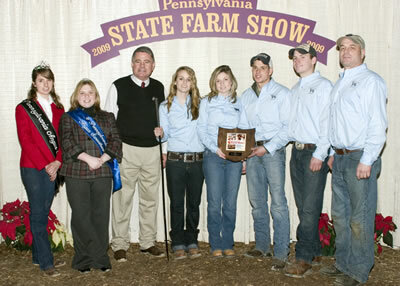 Beaver Creek Angus, East Berlin, Pa., won premier breeder at the 2009 Pennsylvania Farm Show's Angus Show, January 12 in Harrisburg, Pa. Pictured from left includes Katrina Frey, Pennsylvania Angus queen; Shelby Dean, Pennsylvania Angus sweetheart; Tom Turner, judge; and Hannah, Sarah, Denton, Kyle and Greg Grim, all of Beaver Creek Angus. Photos courtesy of the American Angus Association.